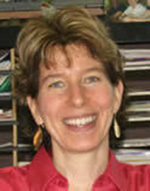 In notable back-to-back papers appearing in the prestigioous journal Science in October, teams of researchers, one led by Nora Besansky, a professor of biological sciences and a member of the Eck Institute for Global Health at the University of Notre Dame, provided evidence that Anopheles gambiae, which is one of the major mosquito carriers of the malaria parasite in Sub-Saharan Africa, is evolving into two separate species with different traits. Another significant study appearing in this week’s edition of the Proceedings of the National Academy of Sciences (PNAS) and also led by Besansky suggests that the mosquitoes’ immune response to malaria parasites, mediated by a gene called “TEP1,” is one of the traits that differ between the two forms of Anopheles gambiae. Both papers have major implications for malaria controls efforts and could eventually lead to new malaria prevention efforts. The Science papers described a painstaking genomic analysis by Besansky and an international consortium of scientists that revealed that the two varieties of Anopheles gambiae, called M and S, which Besansky describes as physically indistinguishable, are evolving into two distinct species. In the new PNAS study, the researchers performed genome-wide comparisons of M and S to pinpoint the genetic differences that could help explain how they are adapting to different larval habitats. One of the genomic regions with the most pronounced differences between M and S contained the TEP1 gene. The researchers report that they found a distinct resistance allele (one of two or more forms of the DNA sequence of a particular gene) of TEP1 circulating only in M mosquitoes despite the fact that M and S mosquitoes live side-by-side in many parts of Africa. The authors demonstrated that this allele confers resistance to human malaria parasites. The patterns of genetic and geographic variation in the TEP1 gene suggest that this resistance allele arose recently in M populations from West Africa, and that it is beneficial in the mosquitoes’ ability to fight off pathogenic infections. Previous research has shown that TEP1 confers broad-spectrum protection against bacteria and parasites, so resistance is not specific to malaria parasites, and may have evolved in response to entirely different pathogens found in the aquatic habitat of immature mosquitoes. The implication for malaria transmission by the adult mosquitoes is nonetheless apparent. “On theoretical grounds, we expect that as two groups of mosquitoes begin to adapt to alternative types of habitats, aspects of their behavior and physiology will change to improve their survival in those habitats,” Besansky said. 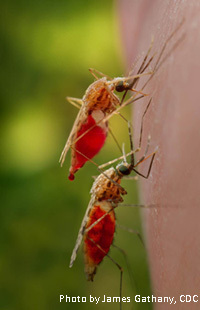 “Even though none of these changes may come about as a direct consequence of infection with malaria parasites, changes in mosquito lifespan, fertility, or density that can accompany ecological adaptation will impact the mosquitoes’ role in malaria transmission. Our results provide a possible example of this process. Besansky notes much work remains to be done to better understand the specific forces driving immune and other changes in M and S, and their impact on malaria transmission. Important, but challenging, next steps will be to study mosquito immune responses under conditions that more closely mimic those encountered in the field in natural populations. The research study was funded by the National Institute of Allergy and Infectious Diseases (NIAID).